This finding is consistent with previous studies. For example, a study conducted by the market research company Kadence International, which included 1410 people aged 40 and older, across 7 European countries, indicated that 80% of people struggled to read important text on medicine and food labels1. In the US alone there are over 140 million people that are in the age group of 40 years old and above, and it is likely that about 80% of this group (112 million people) have difficulty reading important information on product labels. This is of particular concern in the area of medications and the potential for medical error. According to a report prepared by the IOM (Institute of Medicine) medical error injures 1.5 million Americans per year and results in over $3.5 billion dollars of lost productivity, wages, and additional medical expenses. Medical error also causes about 7000 deaths per year2,3. The study indicates that 33% of the medical errors were caused by packaging and labeling issues, which includes small font size, crowded text and poor contrast. 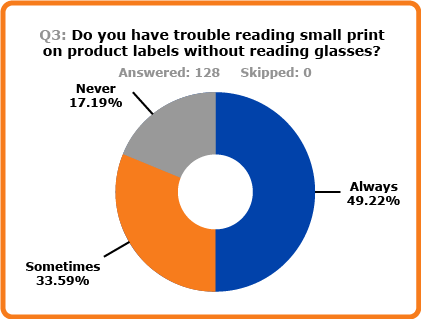 It was clear from the survey that a large majority of people would use a magnifier device if it were included with the product. The convenience of having a magnifier close at hand when using the product will increase the likelihood that the consumer will read important information on the label, thus reducing the chance of error from reading information improperly or not reading it at all. In addition to increasing product sales, the association of a magnifier device with the product will help ensure proper use of the product and reduce the chance of adverse outcomes and dissatisfaction with the product. 4) 43% of consumers surveyed indicated the association of a magnifier with the product would influence what store they would purchase from. This question was included to see whether the association of a magnifier device with a product would have an influence on what store a consumer would purchase the product from. For example, if a particular chain pharmacy provided product that had an associated magnifier would this influence the consumer to purchase product from that pharmacy versus another chain pharmacy that did not offer that option.